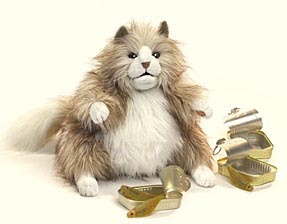 A princess among kitties, this whimsical Fluffy Cat has a moveable mouth with a realistic tongue to demand more kibbles. Her extra fluffy body and long luxurious tail are sure to illicit lots of laughs. Workable mouth and front paws. 12" tall.